What is your current level of stress? How fast is your world moving? How much chaos do you experience in your personal and professional communities? 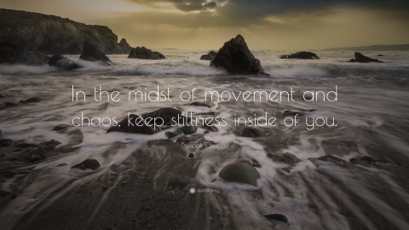 What strategies do you use to slow things down to find greater calm, and the peace of mind we all seek? Sadly, the weekend to rest or that vacation we so desperately need to recharge may be days, weeks, even months away. What can you do at this very moment to keep a source of stillness inside you, to call up and use at a moment’s notice? This entry was posted in Attitude, Stress and tagged attitude, Barry Demp, calmness, Demp Coaching, stress, The Quotable Coach by Barry. Bookmark the permalink.